In April of 2014 the E-3A and E-3D Airborne Warning and Control System (AWACS) Components conducted Exercise VIRTUAL MAGIC, in which AWACS Combat-Ready mission crews at Geilenkirchen Air Base, Germany, linked operations with Combat-Ready mission crews at RAF Waddington, UK, in order to conduct a simulated exercise in the virtual environment. Virtual Magic was the culmination of an extensive effort by the two Components to launch an operational exercise within the Mission Training through Distributive Simulation (MTDS) and Distributive Mission Training (DMT) environments. In general, simulators provide a tool for pilot training that allows saving fuel and maintenance costs as well as mitigating the risk associated with diverse flight ­manoeuvres in a live training mode. Simulators origin­ally only provided training features for basic flight control of a single aircraft. Conventional simulator training, in general, offers structured environments with scripted procedures that do not support combined and joint combat training. It limits training to procedures and processes inside the weapon system, not supporting complex, multi-platform combat environments. As an example, conventional fighter simulators are able to simulate flight operations, but external inputs from an AWACS or Control and Reporting Centre (CRC) are pre-scripted and usually injected by a non-Command and Control entity. This limitation, within most current simu­­lators, leads to unrealistic and ineffective simu­lated events. Vice versa, the CRC and AWACS crews need to be provided scripted inputs from fighters and other external weapons systems. Advanced simulator technology is capable of simulating complex flight scenarios in virtual tactical en­vironments that involve multiple aircraft and the ­mutual exchange of command and control data. MTDS and DMT are current, state-of-the-art simu­la­tion concepts, developed for and used by the US Air Force (USAF) on a daily basis, which additionally allow for web-based combined simulator training at geographically separated units. The general concept for MTDS is to connect separate flight simulators in a virtual environment with minimal structural constraints, so that the simulated events can evolve and change dynamically, thus emulating a real-world oper­ation or exercise. By introducing different weapons-system simulators in a combined, virtual environment, aircrews are offered the opportunity to conduct training in direct collaboration with other alliance aircrews. Furthermore, MTDS provides a ‘man-in-the-loop concept’ which significantly reduces the realism gap that currently exists between live operations and the simulator training historically provided. Therefore MTDS/DMT does not only lead to considerable reduction of live-fly training requirements with the associated costs. It also represents a significant improvement of aircrew training quality, offering an unprecedented variety of training options in combined and joint flight operations. Therefore DMT does not only reduce costs and enhance the quality of training, but it leads to extraordinary cost savings and can offer tailored training objectives. The US Air Force has developed a robust DMT network to facilitate exercises such as VIRTUAL FLAG and ARCTIC TRIAD. The 552nd Air Control Wing (ACW), Tinker Air Force Base, Oklahoma (home to six AWACS and two Air Control Squadron (CRCs) line squadrons) has been executing DMT for the past seven years. The DMT training includes connectivity with fighter simulators, bomber simulators and Command and Control platforms throughout the Combat Air Force (CAF). This training is used for Basic-Qualification Train­ing, Combat-Ready Training and spin-up training for specific operations. Within NATO, the MTDS project has been a major initiative for the past seven years. Various NATO-sponsored work groups and armament councils, such as the Model and Simulation Group 128 and Joint Cap­abilities Group Command and Control, have studied the feasibility of conducting DMT throughout NATO. The primary driving forces for the development of MTDS and DMT are the resource-constrained environment faced by NATO nations and the increasingly limit­ed airspace in which to conduct air operations. Headquarters NATO Airborne Early Warning and Control (NAEW & C) Force Command is committed to ­develop its own MTDS network in order to advance current simulator capabilities. Throughout the development of DMT at HQ NAEW & C Force Command, the E-3A Component has executed various test and development exercises. Exercise GOAL POST was the most successful and significant of these experiments where the primary mission simulator at Geilenkirchen Airbase’s Mission Training Centre (MTC) connected to laboratories at NATO Communication and Information Agency (NCIA) in order to prove the feasibility of connecting to outside-entities through established networks. The success of Exercise GOAL POST paved the way for the execution of Exercise ­VIRTUAL MAGIC. The planning and preparation of VIRTUAL MAGIC was extremely challenging. Hundreds of technical, security and political requirements had to be fulfilled in order to connect the MTC at Geilenkirchen with the Air Battle­space Training Centre (ABTC) at Waddington. The technical requirements were relatively simple to solve due to the fact that the two MTCs were constructed and managed by the same contracting company. The poli­tical hurdles involved receiving special permission for information exchange between NATO’s governing bodies, United States State Department and the British Ministry of Defence. Finally, the security requirements had to be established to ensure the integrity and secur­ity of information that was within the NATO ­Secret ­do­main. Despite the challenges, the teams from ­Waddington, Geilenkirchen and SHAPE persevered and accomplished all established requisites. The exercise itself was a Major Joint Operation scenario that integrated lessons learned and challenges experienced in Operations ALLIED FORCE, AFGHAN ASSIST and UNIFIED PROTECTOR. Within the scenario there were over 100 aircraft and command agencies being simulated. It took place over a large territory that required two AWACSs for airborne command and control. The primary objective was to force extensive ­co­ordination and collaboration between the two AWACS crews on-station, which were the primary training ­audience. These AWACS crews divided the battle manage­ment area into two areas of responsibility, estab­lishing a division of labour for defensive and ­offensive operations control and air-to-air refuelling as well as coordination with external command and control agencies. The roles of the fighter pilots, Combined Air Operations Centre (CAOC) and CRCs were simulated by the Exercise Control (EXCON) element consisting of a large cadre of contactors and Air Battle Management instructors located in both Geilenkirchen and Waddington, connected through the network. The EXCON worked off basic guidelines, but reacted dynamically and ‘real-time’ to the inputs of the AWACS crews, which created an extremely flexible and realistic scenario. At all levels of training, to include basic instructional and advanced knowledge training, the MTDS concept offers a training environment that in some instances can even surpass live training. Within the distributive environment, simulations can present realistic scenarios that are just not feasible in the real-world environ­ment due to resource constraints. Thus, the major advantages of DMT are significant cost savings and unprecedented training value with regard to complex, dynamic, tactical air operations. is the Chief of E-3A Aircrew Training Branch, Headquarters NATO Airborne Early Warning and Control, SHAPE, Belgium. He leads and manages multiple training programs, to include synthetic training devices, for the NATO aircrews assigned to operate Alliance’s 17 E-3A/AWACS aircraft. As the branch chief, he is responsible for identifying critical E-3A training shortfalls and pursuing material and non-material solutions to ensure future relevancy for future operations. Additionally, he coordinates E-3A participation in experimental training exercises in which test initiatives are organized with acquisition and industrial partners. Lieutenant Colonel MacLean was commissioned in 1999 through the Officer Training School at Maxwell AFB, Alabama. 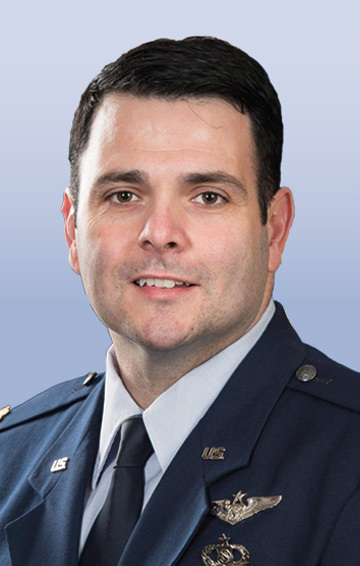 A Senior Air Battle Manager with more than 2,000 hours in the E-3A and E-3B/C, Lieutenant Colonel MacLean has flown in and supported numerous contingency operations including Operations SOUTHERN WATCH, NOBLE EAGLE, ENDURING FREEDOM, and IRAQI FREEDOM.